The Appenzeller Sennenhunde, also known as the Appenzeller Mountain Dog or Appenzeller Cattle Dog, is a working dog breed originating in Switzerland. This extremely rare breed was created as a working dog and continues to serve in this capacity till this day. The Appenzeller is a medium to large sized breed, with muscular features, an attractive shorthaired coat, and a high level of innate intelligence. This breed has been traditionally used as a herder, draft dog, and watchdog used to guard livestock and farmsteads in Switzerland. Watchful, intelligent, wary, protective, and loyal are all words used to describe the Appenzeller. This breed is used to working, and they possess a high level of energy that makes them perfect for long days on a farm. The Appenzeller must be trained and socialized from a young age. They are extremely intelligent and learn new commands and tasks with ease. However, this breed is known to be mistrustful of strangers so they must be socialized from a very young age so as to curb misbehavior. The Appenzeller is an extremely high energy breed. Their ideal environment is on a farmstead or in a rural area, guarding livestock and property. If these are not available, other outlets for their boundless energy must be found. A long daily run, vigorous exercise, or an extended play session will be the minimum for this breed. The Appenzeller is a very healthy medium to large sized dog breed that lives on average 12-13 years. The Appenzeller is an extremely rare and hard to find dog breed. The rarest of all four Swiss dog breeds, the Appenzeller is not AKC recognized. However, they are found more commonly in their native country of Switzerland, where they are still used on farmsteads. Feeding requirements for this breed will vary greatly, due to their high energy output and individual requirements. They will thrive with a high-quality food that contains a good balance of proteins and fats. Avoid any grain-based fillers, such as corn, soy, or wheat. An average Appenzeller weighs between 50-70lbs, so expect to feed them between 2 ½ and 3 ½ cups of dry food a day, split into two meals. 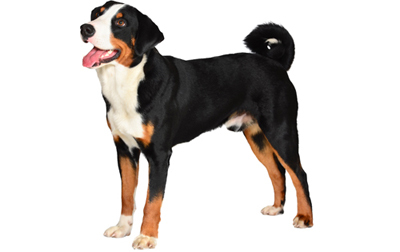 A working Appenzeller will need to be brushed multiple times per week in order to keep their coat free of debris. During coat grooming, be sure to check your pup’s eyes and ears for any signs of damage or infection. A working Appenzeller should keep their nails trimmed through regular running, but be sure to check and trim your dog’s nails regularly as well. Are Appenzeller Sennenhundes Good With Kids? The Appenzeller is known to be friendly with kids, however, play should be supervised and your Appenzeller should be socialized with children from a young age. This is because this breed has been bred as heelers, and are known to nip at the heels of passing children during play. 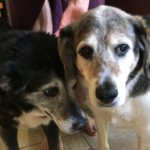 Because of the rarity of the breed, there have been no specific health studies on the Appenzeller to determine high risk for specific ailments. However, some lines of Appenzellers are known to suffer from hip dysplasia and elbow dysplasia, both common ailments in medium to large sized breeds. Hip dysplasia in dogs is a condition that stems from a loose fit between the femur and pelvis. This loose fit causes the cartilage that pads these two bones to wear down unevenly. Although hip dysplasia can be diagnosed in younger dogs through a physical examination, the only notable effect is a laxity in the hip assembly. However, later in life uneven wear of the cartilage leads to painful arthritis, bone spurs, and eventually canine lameness. Similar to hip dysplasia, elbow dysplasia in dogs is caused by an improper fit in the forelegs at the elbow joint, between the elbow and wrist (radius and ulna.) The improper fit between these two joints causes the cartilage that pads these bones to wear down unevenly, causing pain and lameness. Unlike hip dysplasia, elbow dysplasia generally presents at a very young age during the puppy growth period. Signs of elbow dysplasia are an uneven gait, slow recovery from lameness in the forelegs following exercise, and symptoms that get worse over time. The exact cause of elbow dysplasia is unknown; however, it is believed to be a combination of genetics, diet, trauma, and excessively vigorous exercise at a young age.